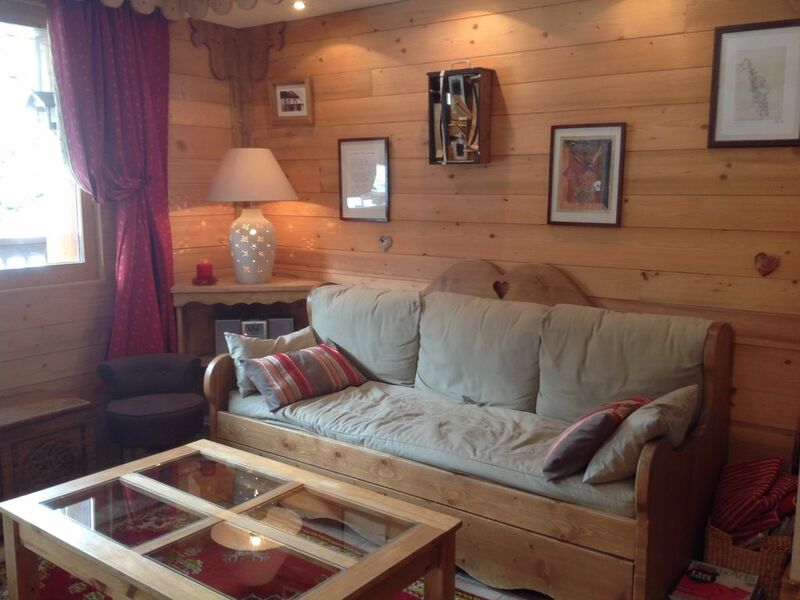 Ideally located for direct access to the slopes and relax away from the noise of the center. Garage in the basement. Ski lockers. South balcony ideal for sunbathing. Children can play around the residence. Savoyard charm decor. Maximum comfort and equipment for a pleasant holiday. very Crockery. A room with two beds 80 can be joined to a sleeping 160. The sofa in the living offers two bunk beds of 80 being placed at the same height and can also be a double bed. Plenty of storage. Bathroom with bath. separate toilet with washbasin. POSSIBILITY grouped with OTHER SIMILAR APARTMENTS in the same residence for a vacation with friends. Nice apartment (exactly like in the pictures) clean, warm and cozy, equipped with all the necessary items for a short or a longer stay. It comes with a parking place and storage for skis at the -1 level. Very responsive owner, Ms. Christiane, who offered us, ahead of time, detailed information on how to reach the destination and what to expect there. One can ski directly from the hotel or can take the free shuttle to the center of the resort which has the final destination in front of the stairs to the gondola (very convenient especially when traveling children). We had a great vacation mostly because of this apartment so, I highly recommend it. We are very happy to Know that you have been satisfied with your skiing holiday and that you have appreciated our appartment. Hoping to meet you again. Nous sommes très heureux que vous soyiez satisfait de vos vacances au ski et que vous ayez apprécié notre appartement. Espérant vous accueillir à nouveau. Hübsche kleine Ferienwohnung im Berhütten-Stil mit viel Holz und allen notwendigen Ausstattungen, die der Bergsportler benötigt. Die Lage des Hauses direkt am Hang ist ideal. Tiefgarage ist vorhanden aber nicht zwingend erforderlich. Sehr netter und unkomplizierter Kontakt mit der Vermieterin. Il ne manque rien pour passer des vacances cool. Jolie déco. De plus situation est exceptionnelle. On chausse et on quitte les skis devant la maison. Bronzing sur balcon. Grand Aquamotion aquatic center in the resort. Snowshoeing, cross country skiing and hiking. In summer, hiking and fishing in the heart of the Vanoise National Park. Les taxes de séjour de 0,99€/ adulte de plus de 18ans / nuit sont à verser avec le solde de la location, soit 15 jours avant l'arrivée.